Reading a Christmas book every night during December is a Christmas tradition I have tried and tried to implement since Bria was about two years old. It's difficult, though, since the month of December is typically one of the busiest months of the year for us. There are a lot of late night concerts and other activities which often means skipping our reading for the night as we crawl home with cranky children and exhausted bones. This year, the kids are all old enough that I am feeling like going to bed a little bit later isn't going to hurt anyone, and this activity brings so much of the Christmas Spirit into our home, that I'm trying to be a stickler no matter how late the night is! We've still missed a couple nights, but overall this year has been an absolute triumph when it comes to reading Christmas books! I keep all the books in the magazine basket by the fireplace (don't even ask where I put all the magazines--let's just say my office is now a bigger disaster than ever!) and we cuddle up on the couch each night to read. The girls take turns picking which book we will read, and I have noticed that they will spend a lot of time looking through the basket when they know it is their night to pick. They definitely have favorites! Here is a list of the books in our basket (affiliate links). I try very hard to find books that are Christ-centered, and don't focus on the Santa part of the holiday. I love reading these stories to my children, and I often cry while doing it. So does Chloe. Bria just rolls her eyes at us, but I know she loves hearing the stories even if tears aren't her way of feeling the spirit. When Jesus Was Born in Bethlehem by Joseph Brickey. This gorgeous book is made entirely of scriptures surrounding Christ's birth and beautiful paintings by Brickey. It has a special place in my heart because my brother was the model for Joseph. Even though the artist changed details like hair color, it is still my brother's face looking back at me as we read this book. Two of the paintings in particular have particularly classic Dave expressions on Joseph's face. If you are LDS, you are probably familiar with at least the painting of Joseph leading the donkey with Mary on its back to Bethlehem as it now hangs in many of our temples and other church buildings. What Think Ye of Christmas? by Ester Rasband with paintings by Jana Parkin. Another gorgeous art book which reminds us to remember Christ and to find symbols of Him in the midst of all the busy-ness that Christmas can bring. Jana is a blogging friend, and when this book first came out I reviewed it here. I love it. Christmas Day in the Morning by Pearl S. Buck. Pearl S. Buck wrote one of my all time favorite books, The Good Earth, so when I found that she had written a Christmas story, I snatched it up. It's a wonderful story about a boy who learns the joy of giving when he plans a Christmas surprise for his father. The Carpenter's Gift: A Christmas Tale about the Rockefeller Center Tree by David Rubel tells the story of the very first Rockefeller Center Christmas Tree. The story behind this tree reminds us of the spirit of giving and of helping those in need. It has also taught me some cool things about the tree, such as its partnership with Habitat for Humanity. Christmas from Heaven: The True Story of the Berlin Candy Bomber by David Warner. This book is new for us this year, but it tells the story of the Candy Bomber during World War II. It's a lovely rendition of the story, and it even comes with a DVD of the Mormon Tabernacle Choir performing music to the reading of the story by Tom Brokaw. The Christmas Train: A True Story by Thomas S. Monson. If you are LDS, you will recognize that this book is written by our prophet. It is the true story of himself as a young boy at Christmas. He learned for the first time the spirit of giving as he had the opportunity to give a train to a less-fortunate neighbor boy. The story is a universal story of Christmas, no matter what your religion. There is also an interactive iPad app available with the book to hear President Monson read the book to you. 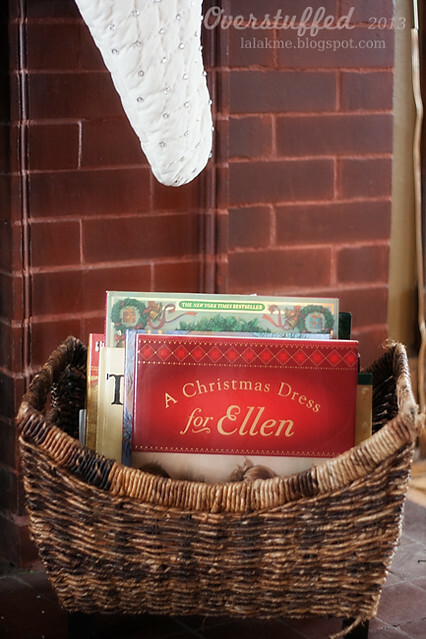 A Christmas Dress For Ellen by Thomas S. Monson. Another book by President Monson, this one relates a story from his own family history. A classic Christmas tale of a family in need who was helped in a surprising way. The Christmas Miracle of Jonathan Toomey by Susan Wojciechowski is one of our very favorites at our house. I first read it when Joel and I were dating, and I remember I gave a copy of it to his parents for Christmas that year. It is the story of a gloomy woodcarver and how he finds the joy of Christmas when he meets a little boy and his mother who need a Christmas nativity carved. 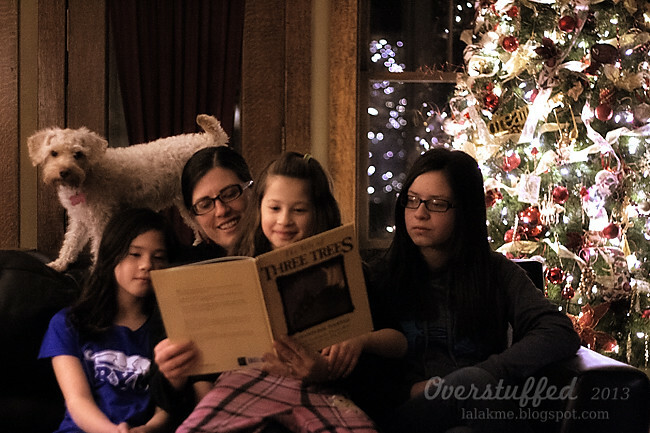 Chloe loves this book so much that she begged to be the one to read it to the family the other day. It's a good one. Legend of the Christmas Stocking by Rick Osborne is the story of a little boy hoping his father will come home from sea in time for Christmas so he can get the Christmas gift he has been hoping for. 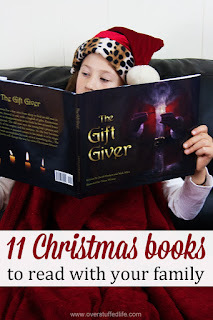 The legend of the Christmas stocking and a little bit about how St. Nicholas came to be is spun into the story, which has been fun for my girls to learn about. Room for a Little One: A Christmas Tale by Martin Waddell. My girls are probably growing out of this one as it is definitely geared toward much younger children, but it is still a lovely little story. The animals in the stable are the ones who serve each other as they help each other stay warm, and then they are blessed to witness the birth of our Savior. The Gift of the Christmas Cookie: Sharing the True Meaning of Jesus' Birth by Dandi Daley Mackall. This is a book which teaches us about the German/Austrian Christmas cookie tradition (springerle) and how the cookies tell of the story of Jesus' birth. Humphrey's First Christmas by Carol Heyer. This is another one that is for younger children, but it's so cute, the girls really like it. Humphrey is a camel who only wants the best for himself and is prone to complaining a little. He is traveling in the caravan of the Wise Men as they travel to see Jesus, and when he does see Jesus his entire perspective changes. The Year of the Perfect Christmas Tree: An Appalachian Story by Gloria Houston is a story of a little girl named Ruthie who helps her father pick the Christmas tree for the next year. But her father goes off to war, and the town almost doesn't have a tree. I gather that this is a true story about the author's own mother, but I am not 100% sure. Christmas Sweater by Glenn Beck. Yeah, bet you didn't know that Glenn Beck wrote a Christmas story. I like how it emphasizes the making of Christmas memories and family togetherness over getting gifts. The Polar Express by Chris Van Allsburg. I bought this book on Black Friday this year and it was the first one the girls chose to read. They love the movie so much, that they were very excited to read the book.The book is, of course, slightly different from the movie, but still just as delightful. The Night Before Christmas: The Anniversary Edition by Clement C. Moore. A Christmas classic, I don't need to tell you much about it. It's fun to read together and know that my children are hearing the same story I heard, and my parents, and their parents, too. The Tale of Three Trees: A Traditional Folktale by Angela Elwell Hunt. As the title suggests, this is the story of three different trees and what they hoped to become. One hoped to be a treasure box, another a ship, and the last wanted to grow so tall that it could point people to Heaven and make them think of God. They all got their wishes, just not in the way they thought. Hurry Hurry Have You Heard by Laura Krauss Melmed is another really sweet book for younger children with really beautiful illustrations. We all think of the cow and the sheep at the Nativity, but this book remembers all of the other animals--the fox, the bird, the bunnies, and even the kittens--and how excited they were to hear of the birth of Jesus. A Night Without Darkness by Timothy Robinson. This is an LDS-themed Christmas book about the birth of Christ as experienced by the people in The Book of Mormon. I enjoy reading this one to my children at Christmas to help them learn more about this story which is told from the perspective of a Nephite boy living in Zarahemla at the time of Samuel the Lamanite's prophesy. The Nutcracker by Susan Jeffers. A lovely retelling of the classic Christmas Tale. Sophia read it to us this year—she was very excited to do it because she was completely enamored of how the Nutcracker turned into a prince. Makes me think I need to get a nutcracker or two to decorate with, and that I definitely need to take them to the ballet next year. A Christmas Carol (picture book edition) by Charles Dickens. Obviously, this is not the entire book. Someone (the illustrator perhaps?) has abridged the story for younger folk and it has been illustrated fabulously. This is THE classic story of Christmas and of learning what Christmas truly means. We have a tradition of watching the George C. Scott movie every year on Christmas Adam, so my girls are very familiar with the story and love it. They look forward to this book. How the Grinch Stole Christmas by Dr. Seuss. 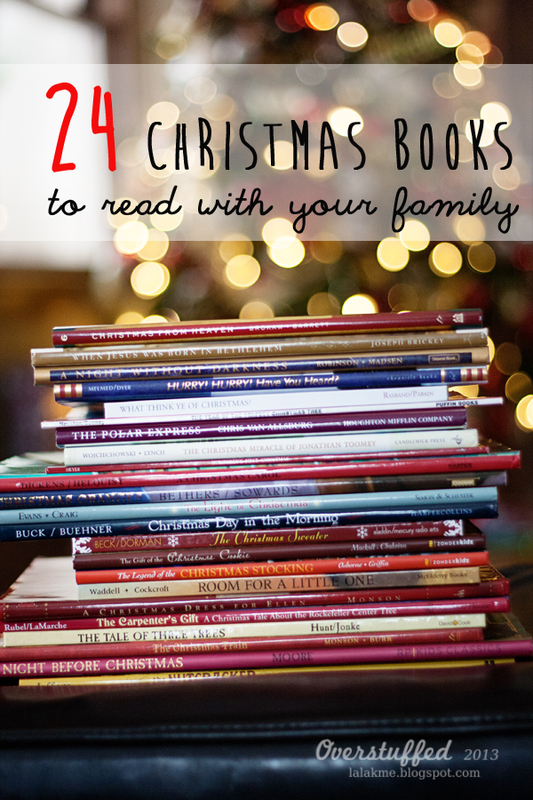 This book is probably in every Christmas book pile in the world, and how could it not be? Everyone loves the story of Cindy Lou Who and her meet up with the Grinch. Even more, everyone loves how the whos in Whoville teach the Grinch about the true meaning of Christmas. Be sure to also read the comments for even more great suggestions from my awesome readers! Phewsh! That's a lot of books—but it's enough for one a day for all of December. We're going to have to double up a bit in the next week so we can read them all, though! I hope you're able to find a few new ones here to add to your own collections—we truly love this Christmas tradition. 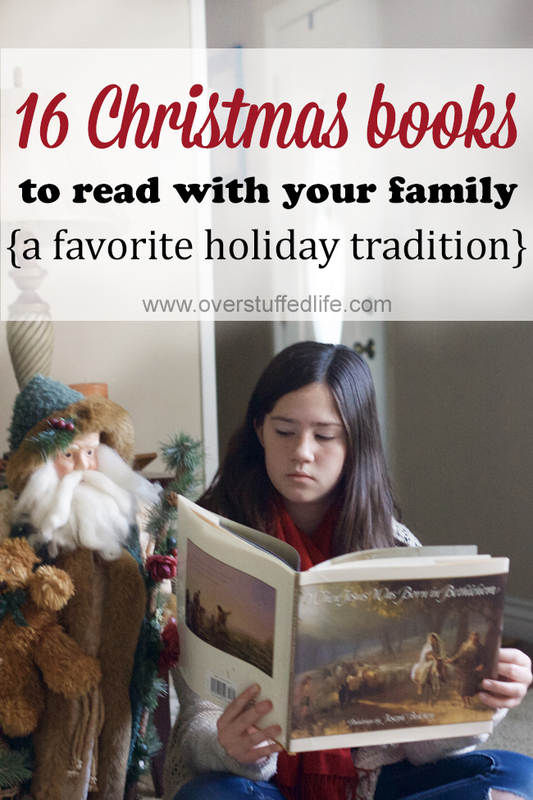 We have several loved stories (some the same as yours) that we read every year, too. Our favorite is The Best Christmas Pageant Ever. It's a chapter book, but fairly short and we usually read a chapter/day within a week. It's hilarious and touching--and while the movie is kinda fun--the book is way better. What about the Little Match Girl? Have you ever read that? I love these suggestions, thanks! One of my favorites (also maybe for a younger crowd) is Mortimer's Christmas Manger.